Every time winter finally passes and the weather starts to change, I get the urge to make this dish. 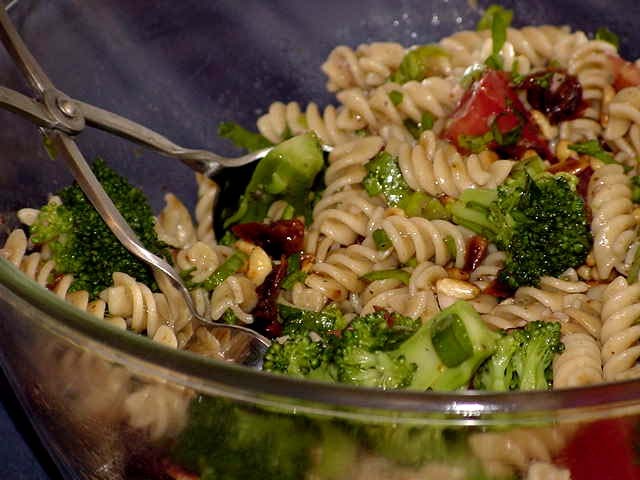 I found the recipe years ago in a vegetarian cookbook and I was intrigued because it didn't have mayonnaise or cubed American cheese in it, two things that seem to be a staple of the kinds of pasta salads I grew up eating. If I remember correctly, the original recipe called for half a pound of regular rotini and half a pound of spinach rotini. I usually just used a pound of whatever rotini I had on hand. It's the marinade that makes this salad. It's subtle, but substantial enough to hold up to the pasta and vegetables. I always use broccoli and some form of tomatoes, but I improvise everything else, depending on what I have on hand. The first time I bought whole wheat pasta was back around 1980. I had already switched to whole wheat bread years before, and brown rice, and was always looking for ways to improve the quality of what I was eating, so I bought some bulk w/w spaghetti at the then only (and original) Whole Foods in Austin. I took it home, made my traditional meat sauce, cooked up the spaghetti, and wanted to throw the whole thing away. It was dense, chewy, gummy, and tasted awful. It was years before I would try it again. When I started seriously avoiding processed foods and was looking for palatable ways to eat whole wheat exclusively, I thought it might be good to try whole wheat pasta again with this recipe. As it turns out, I was right. It was a rousing success. The pasta was nutty and chewy and worked well with the marinade and the vegetables. And since that first experiment, I've never looked back. I've been making it with whole wheat pasta for several years now. And what I learned from this was to look for new ways to eat pasta. My old, traditional pasta recipes did not translate well to the whole wheat variety. Long simmering sauces and casseroles like lasagna do not lend themselves to whole wheat. Smaller pieces work better than spaghetti or linguini, or fetuccini. But a light sauce that has a lot of vegetables is actually better with whole wheat pasta, at least to my tastes now. And if I don't actually prefer whole wheat to regular pasta, at least I like them both the same. And now I have to go bake my sweet spice thing for the second part of TSIR2. By now this is more of a template than a recipe for me. The version in the photo above has no mushrooms or peas, and I was out of red onion so I used a spice mixture with dried shallots for the marinade. I used one large tomato and a handful of smoked sun-dried. Instead of the peas, I added 1/4 cup of toasted pine nuts. Yummy! Cook pasta, drain and rinse under cold water. Drain thoroughly, then put in large serving bowl. Saute mushrooms in butter until tender and brown; add to pasta and toss. Steam broccoli unti tender; immerse in cold water, drain. Pat dry and add to pasta. Defrost peas (or steam if fresh), pat dry and add to pasta. Add cherry tomatoes, parsley and onion and mix well. and shake vigorously. Pour onto pasta and toss well. Cover and chill at least 2 hours before serving, bringing to room temperature.